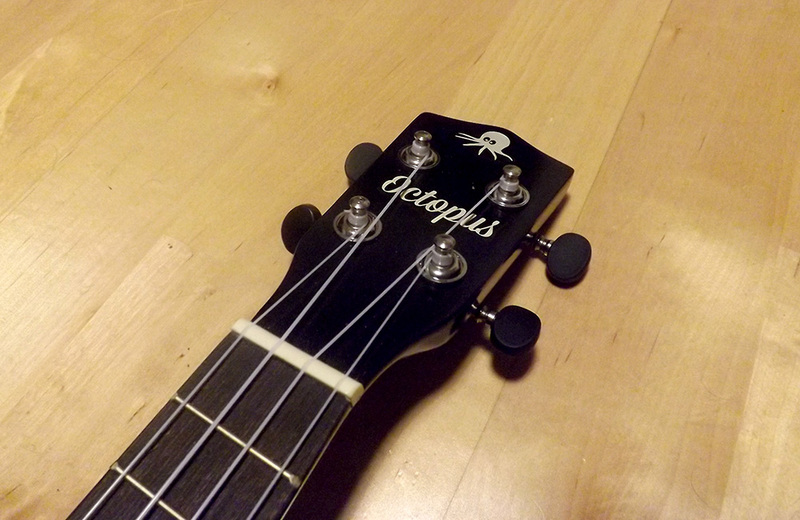 I have to admit I’ve been wanting to get my hands on an Octopus soprano ukulele to try out for quite a while now. Firstly because I’ve read good things about them (for the price) and secondly as I’m eventually going to do some custom artwork on a ukulele and it’s a likely candidate. I’ll start by saying that my expectations weren’t overly high with this one. I’m not sure why, I mean I have read good things about the Octopus before, but when it comes down to it, it’s a musical instrument and it costs around £20. You can only expect so much. Obviously at £20 we’re talking a laminate ukulele. It has unbranded geared tuners, a nicely finished rosewood fretboard and Aquila strings. 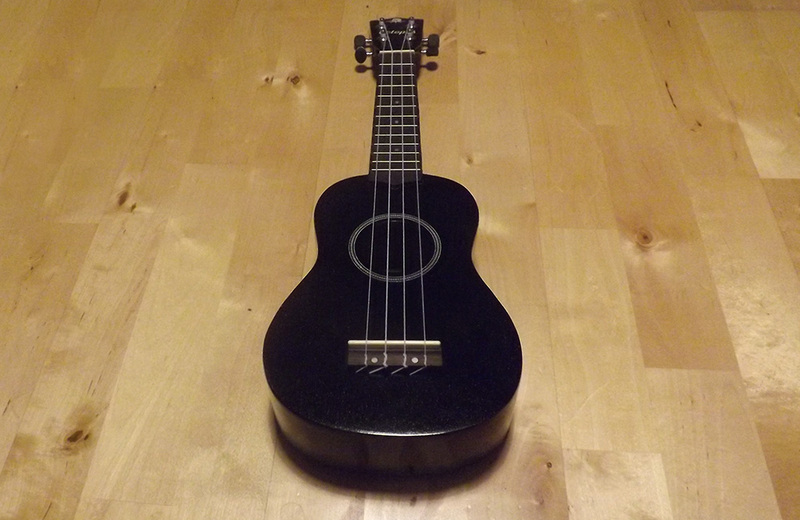 I was pretty surprised on picking it up that it felt pretty solid, it has a nice weight to it and feels quite robust – from that perspective it’s definitely a uke that is probably about as child-friendly as it could be. I’d expect it to be able to take a bit of a beating (within reason). There’s a pretty thick layer of paint covering the body which looks pretty good on general inspection – if you really look closely you’ll see the imperfections but it’s to be expected at this price point. Probably the best way I can describe this uke is no frills but pretty solid. For the price it’s finished to a decent standard, the fretboard in particular feels great. The tuners are pretty standard although I do like the buttons, they’re not super smooth to turn but they don’t grind to any real noticeable extent. On the whole, it feels good. What does the Octopus soprano sound like? Initially I was pretty impressed by the sound, it’s bright and it’s definitely got something about it that I like. There’s a little bit of tinniness there but overall it’s pretty pleasant. Without a doubt the sound was better than I expected and the intonation is good. 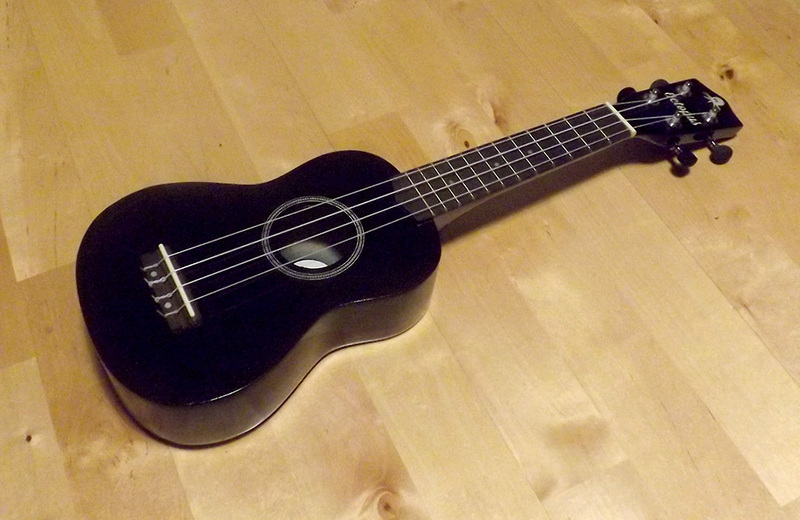 I think it stands up pretty well against my other laminate ukes, some of which cost significantly more. If I had one gripe with this instrument it’s the action. The saddle on mine was high, very high. If you’re a newcomer I don’t really see this as too much of a problem as you’re less likely to be wandering up the neck. I’ve actually removed mine twice now and sanded it down taking off around 2mm and honestly I think I could push a bit further too. I wouldn’t really let this put you off a purchase though. I’d definitely encourage newcomers to have a go at sorting the action out on their ukes, it’s pretty straightforward and you’re going to end up with something that feels a lot more like your own personal instrument once you’ve set it to your own taste. Here’s a short video of me playing Spanish Melody by Paul Summers on it – the sound quality isn’t the best as I just used the iPhone microphone but hopefully it gives you the idea. On the whole for £20 which is basically the price of a round of drinks then I think this soprano is pretty good value for money. It’s not without it’s flaws, but for the large part they’re not deal breakers and it would be unfair to expect perfection at this price point anyway. I’d definitely recommend it to ukulele newcomers on a budget and I think it would make a very rugged uke for younger children. In fact, I’ve bought a few of these myself as gifts for family members over the past few months. Southern Ukulele Store can get these too if you ask them! Thanks Barry, that’s good to know – I’d far rather be pointing people towards Southern Ukulele Store’s door than Amazon. That said, the current ones are listed as having Aquila strings so for anyone making a purchase make you sure you ask them!